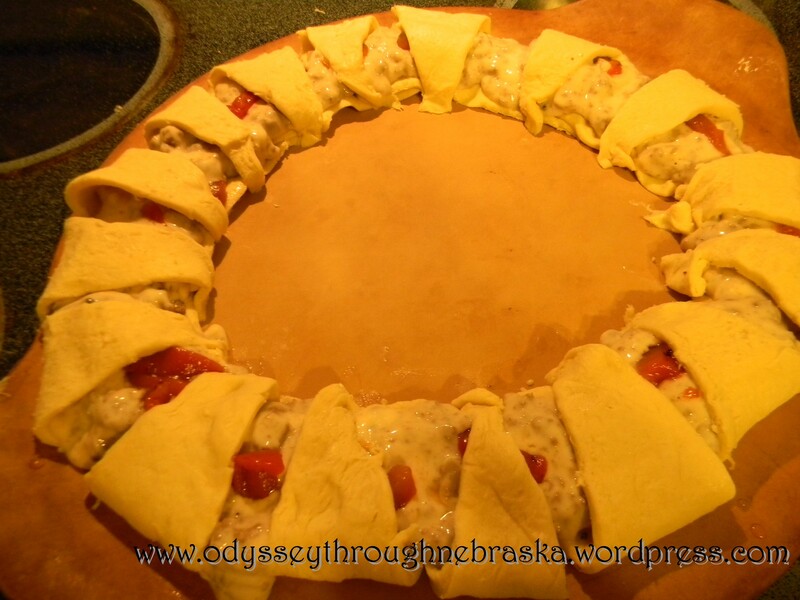 Surprisingly , these days you will almost always find crescent rolls in my refrigerator. This ingredient is essential to my new go-to recipe: the savory ring/wreath. 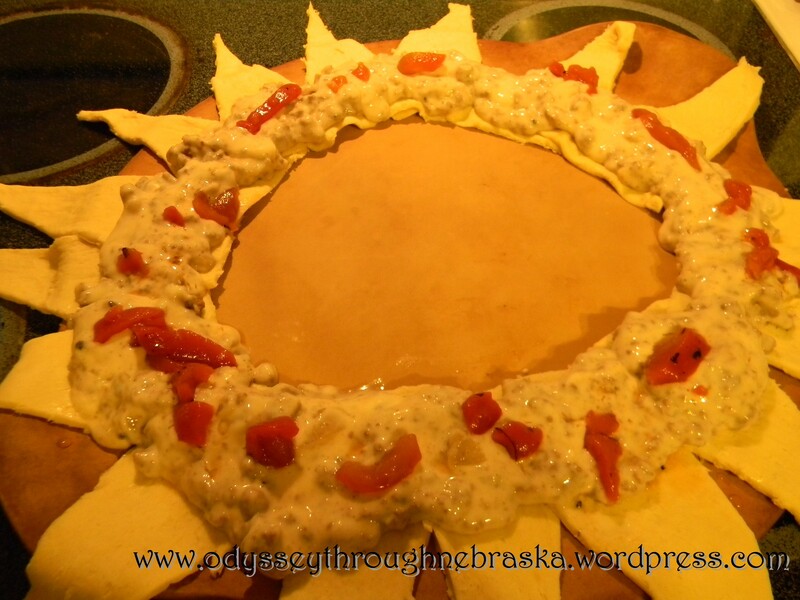 I have eaten these before – Pampered Chef parties used to feature them often. (You can find a few variations on food.com) Once I realized that this was a quick dinner and was a great way to use up leftover meat and vegetables, I have made this often. Another good reason: they are always a hit around here! Press the edges together. Then add your filling. You will need 3-4 cups of filling. This time I used leftover sausage, roasted red peppers and alfredo sauce. This was almost too much filling as some did spill over the edges. (A good excuse to clean my oven!) Then you fold the narrow part of the triangle to the center, tucking it under. Bake at 375 for 15-20 minutes. 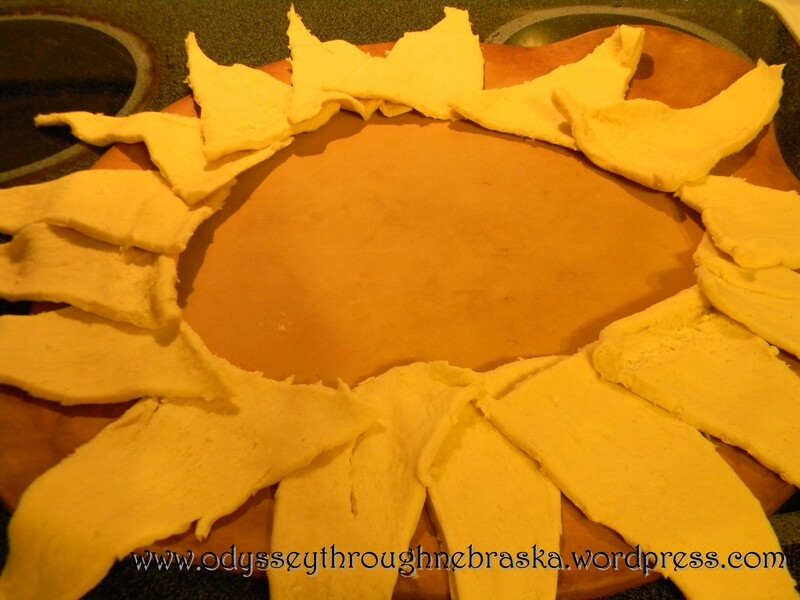 Basically you are browning the rolls and heating the filling. You always want to use cooked meat – raw would not cook up well at all, plus would not be good with the dough. 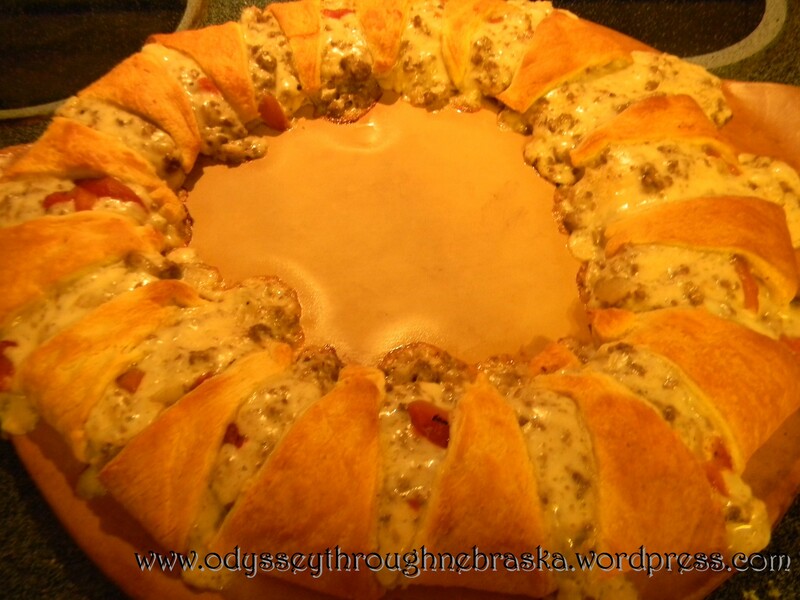 Suggested combinations: ham & broccoli; pepperoni with pizza sauce; taco meat/cheese (a variation known as the Taco Ring in Pampered Chef circles). Options are almost endless! 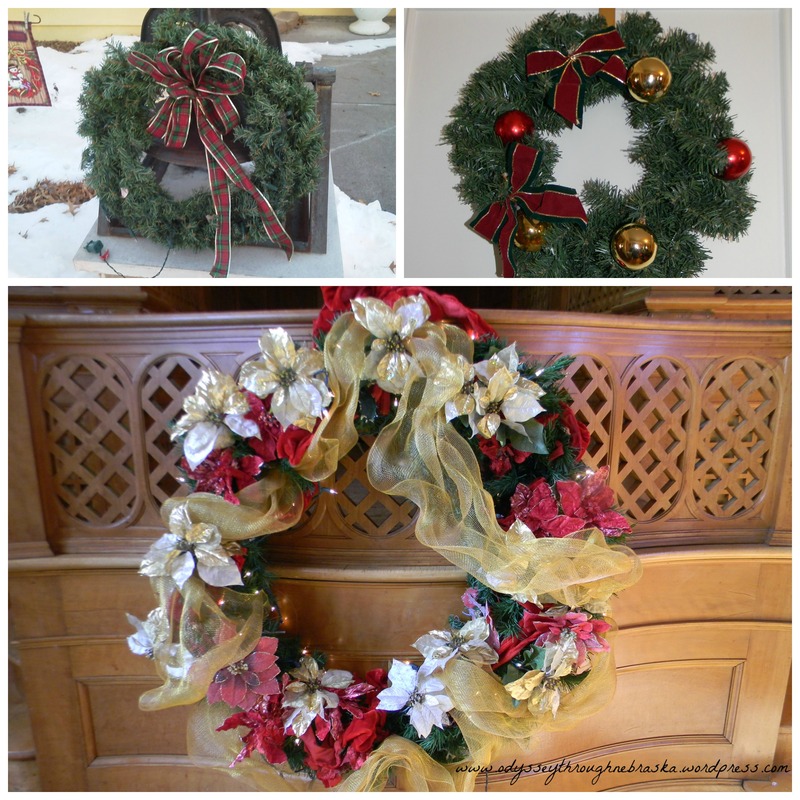 This is a wreath you can enjoy year round. A great idea for ringing in the new year if your plans involve staying home as opposed to going out! Are you a joiner? Do you like to participate in different clubs? Do you belong to any organizations? As I look back, I probably could consider myself an active participant in many organizations. But I have to say, that where I (really we) have belonged tends to fluctuate with the season and ages of my children. Membership is a great option for supporting an organization. Plus when you have a larger family, sometimes joining costs only a bit more than simply paying admission. For instance, for us to visit the Durham Museum several years ago would have cost $30. We could buy an educator membership for $45. Even though the museum was an hour away from our home, belonging there made sense. We just had to return one more time for our membership to pay for itself. 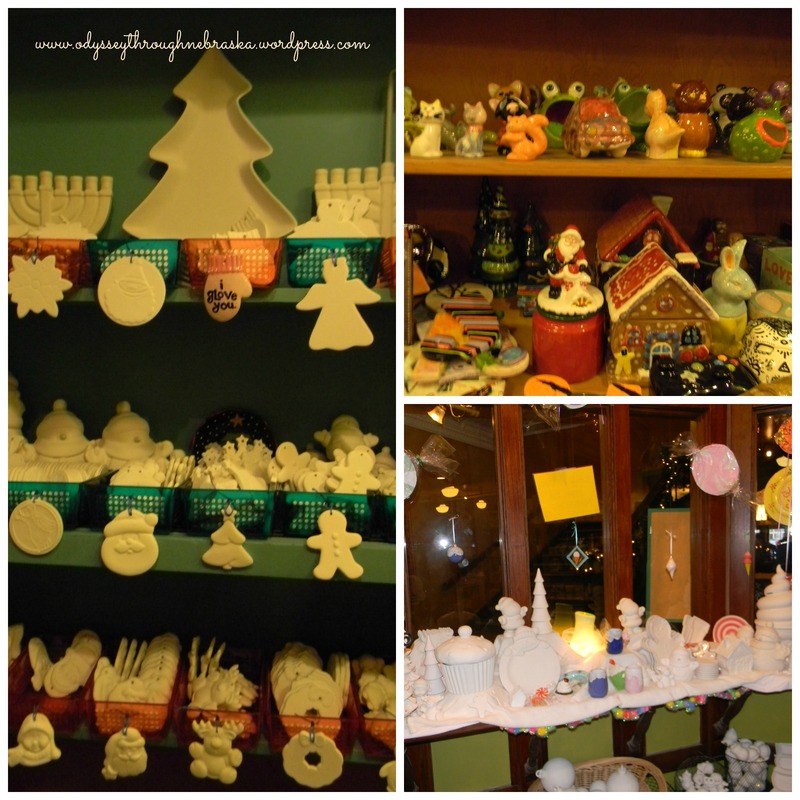 (I think we went back 2 or 3 more times -a great place)! 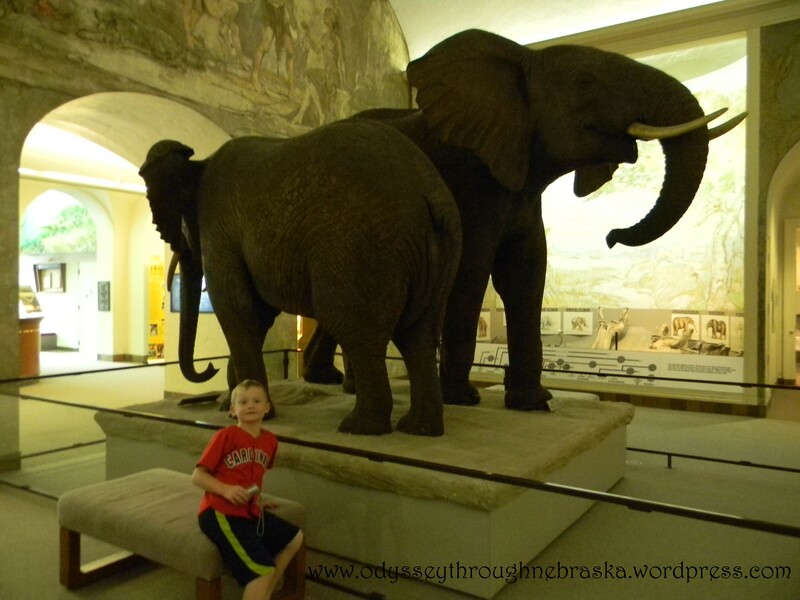 Currently we are members at Morrill Hall in Lincoln. We partially joined this place due to its reciprocal membership benefits. (More on this option next week!) With studying Nebraska, this is also a great place to see displays on Native Nebraskans – both people and even some animals. (Disclaimer: I have to admit that I am not exactly on board with their dating system, so there are certain areas we basically avoid). As I wrote about several months ago, I really love their Discovery Center. 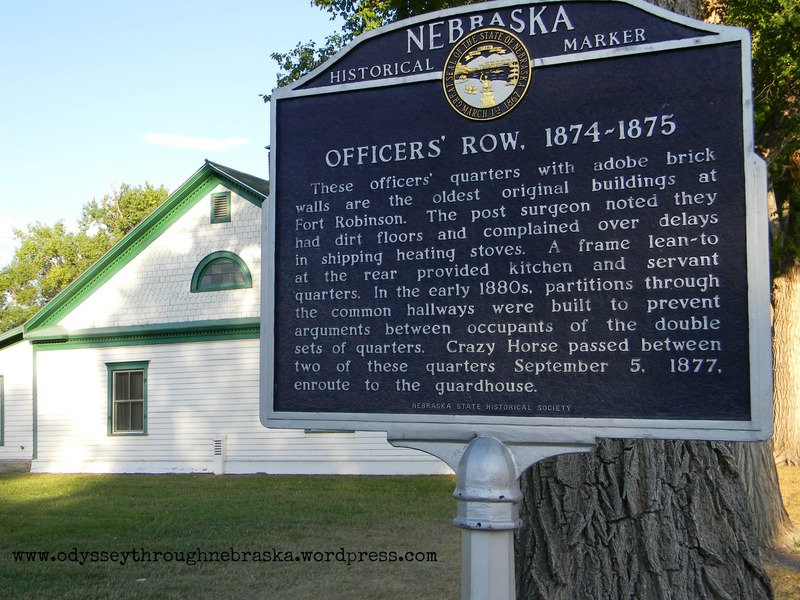 I am also a member of the Nebraska State Historical Society. This allows me to get into their various locations. More importantly, I also receive their publications – quite helpful to this aspiring writer. For this one, I just have an individual membership since kids have free entrance anyway. 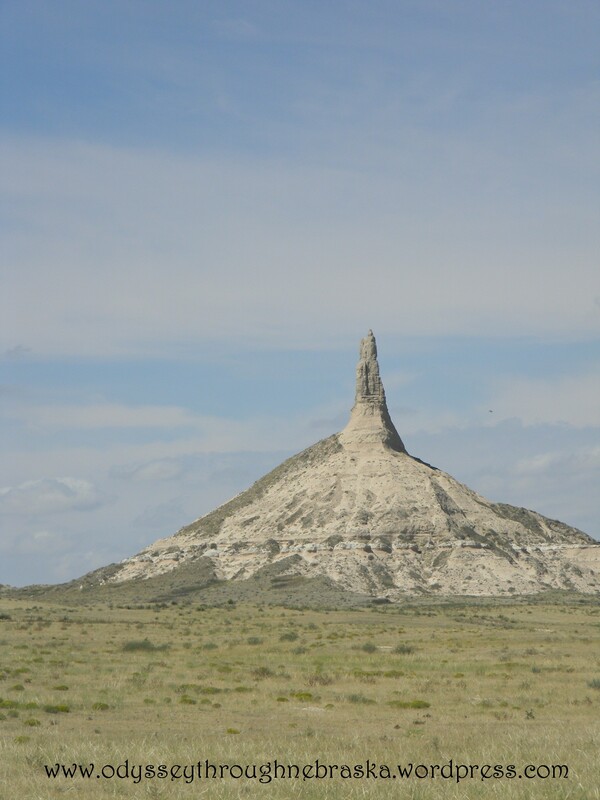 Chimney Rock – one of the places I got in “free” this year with my Nebraska Historical Society membership. How does one decide whether just to visit or to join? 1) Will you be going there often? If the location is a long distance away, a membership may not be justifiable. But if you travel to the region often (visiting grandparents and such), joining may be a good idea even if you are not from that area. 2) Will the cost even itself out? Sometimes memberships are a bargain. A few are a bit more costly. What fits into your budget? Memberships are often great options. Whether you officially join places or not, Nebraska has many great places to go visit. May 2014 be full of adventures across “The Good Life”state! Tomorrow night is the night when almost everyone stays up and greets a new day/month/year. Possibly parties featuring champagne and dancing and lots of people come to mind. To be honest, that was not really our scene BEFORE we had kids, so now that we have children, we are usually looking for ways to include them on this holiday. After all, our years with them at home are limited. Of course so far our kids have not stayed up until that late of an hour. For one thing, they would be rather unpleasant the next day. We have made a point of ringing in 9:00, and one year my husband change the clocks to look like midnight had arrived (they were not fooled or anything 🙂 ) This year we have yet to finalize our plans. There are several great events across the state that are geared for celebrating the new year with children. Many of them feature make-believe midnight activities. While we have not personally experienced the event, my understanding is that the Lincoln Children’s Museum even drops a ball at 8:00 (their pretend midnight hour). 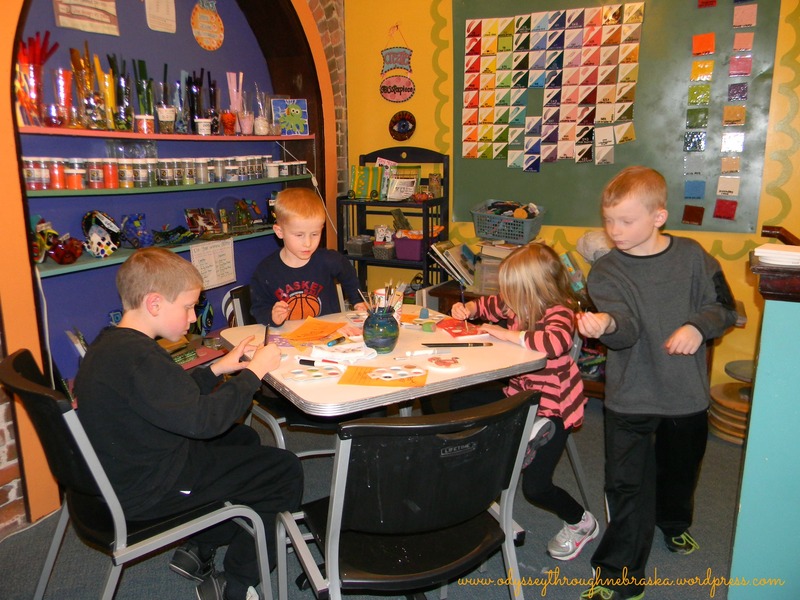 While Kearney, Norfolk and North Platte all have children’s museums or children’s discovery zones, none of them have any specific New Year’s Eve activities this year. 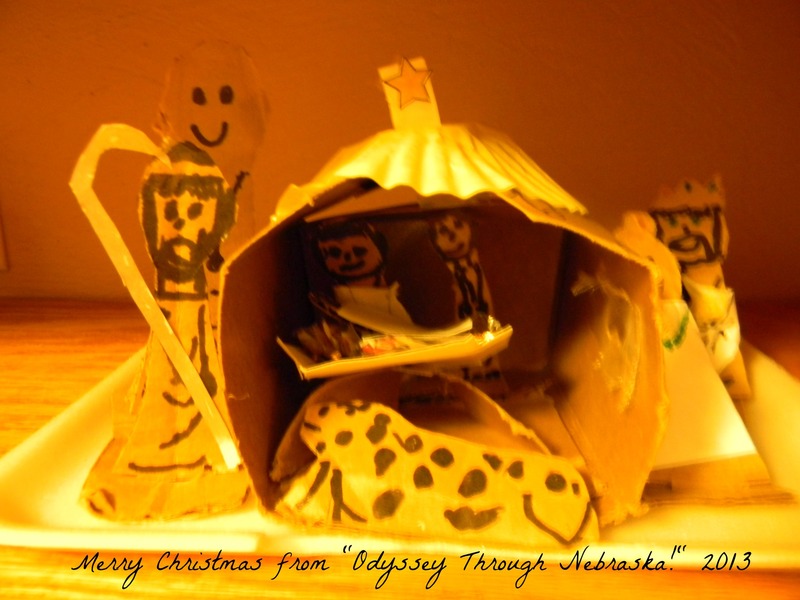 If you know of any additional optional New Year’s Eve activity for families in your area, please post it in the comments below or on the Odyssey Through Nebraska Facebook page. However you celebrate, I hope you enjoy ringing in the new year! 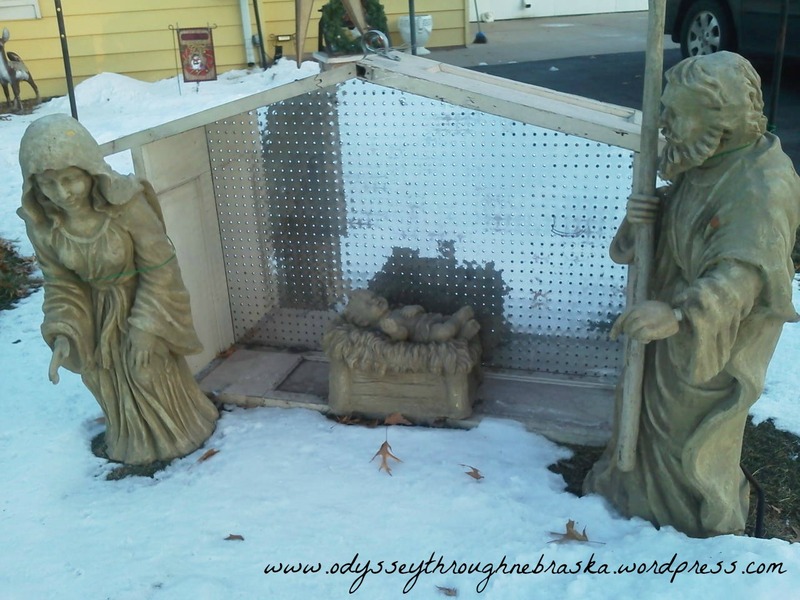 Wordless Wednesday: Merry Christmas from Nebraska! Recalling the brisk “take-your-breath-away” cold, those dozens of steps to the car felt like a mile on those dark Christmas mornings. Growing up, we were often at my grandparents farm house for Christmas. This meant that before dawn, we would be heading down the road to church for their annual Julotta service. (In case you are not Swedish, this word means “Christmas before dawn”) When I was younger, the service used to begin at 6 a.m. 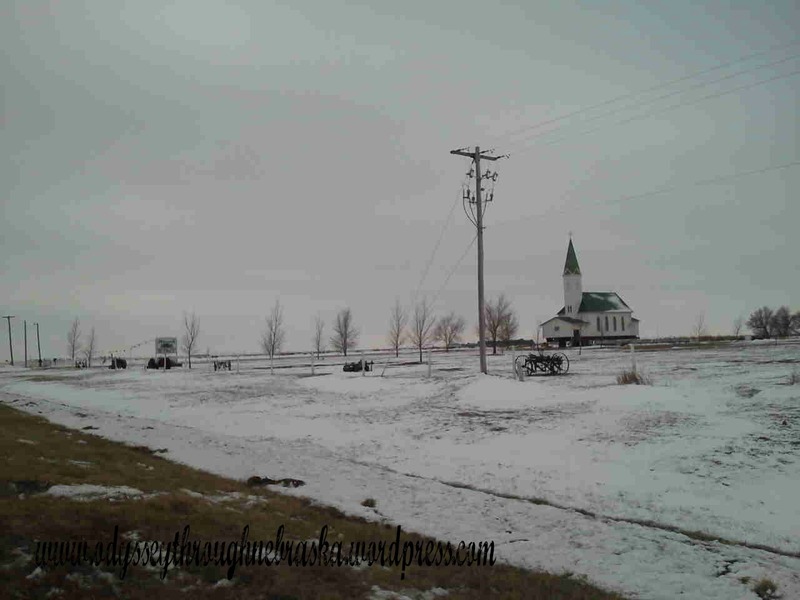 Lately Monroe Evangelical Free Church near Phillips, NE, they gather together at the still-dark-but-not-quite-so-early seven a.m. We would sing carols and listen to a message about the meaning of Christmas. I am sure I had moments of complaining about the early hour, but now that is such a meaningful memory for me. I miss that tradition! Fast forward several years to when I was a newlywed. His family tradition was attending the late 11 pm. service. Greeting Christmas just after midnight at church was also meaningful. Both services involved songs and stories about a Savior. Perhaps you also used to annually attend a Christmas service as a child. Maybe you have been out of the habit. Never too late to try again, many churches offer the hope that can only be found in the Prince of Peace. I had originally thought about listing the locations and times of services across the state. But with 93 counties that are filled with churches, Nebraska has thousands of service options. Instead I just wanted to say that attending a Christmas service is what is important to my family. Maybe this would be a good tradition for you to start as well. 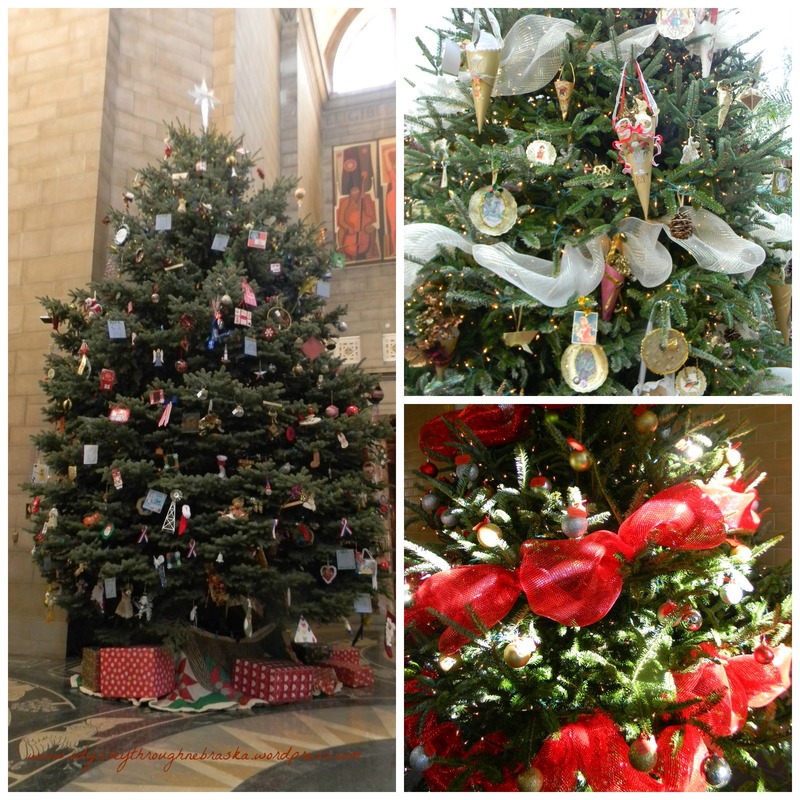 While a church is not the only place to find the meaning of Christmas, most sanctuaries are a good place to start. If you are struggling to find the true meaning of Christmas this season, this video may be encouraging to you. Beginning with Linus sharing the Christmas message (from the best Christmas television special! ), this song talks about the reason for this season. A great reminder for all of us! P.S. 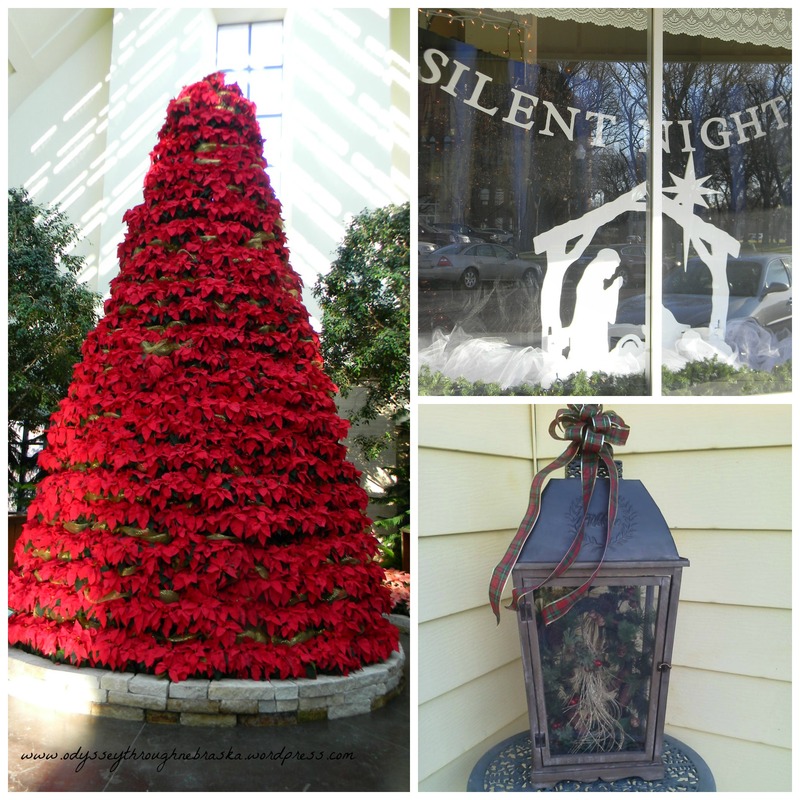 Tomorrow for “Wordless Wednesday,” I plan on featuring some of the sights of this blessed season. Then other than some “Odyssey Through Nebraska” pre-posted Facebook links, you will not hear from again until next week. I am ready to spend some time with my family! (And catching up a bit on my scattered life too! 🙂 Merry Christmas! First of all, sometimes Black Friday brings gift card sales. For the last several years, Hy-Vee has had a deal where you bought 3-4 gift cards at a time, and you can get $5 off each. Yes, I realize it is too late for this year, but just file that little info. away. 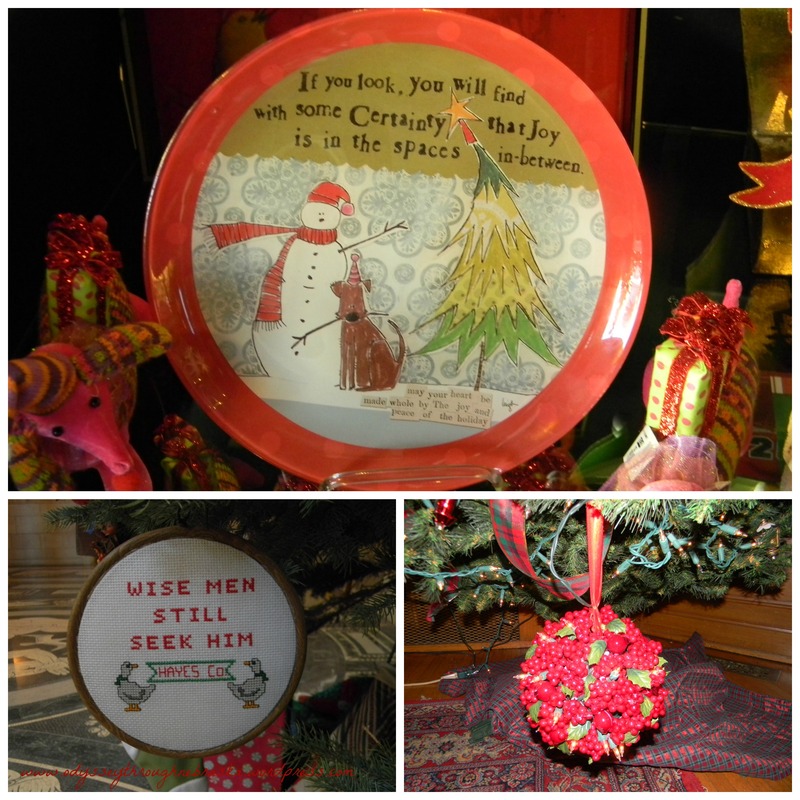 Closer to Christmas, stores might again be offering sales on these – worth checking around! Second, many stores offer a “bonus” if you purchase a certain amount. Usually you can even split the amount on several cards. Either you get an extra amount on the card for free or sometimes a free meal card! Third, certain places actually give to charity if you purchase a gift card from them. 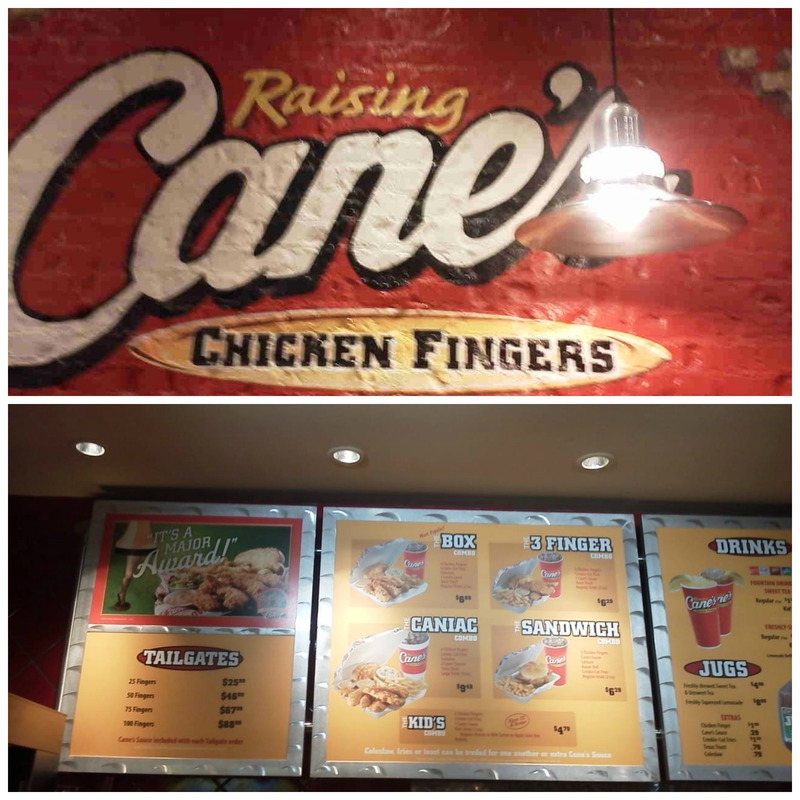 The best example is Raising Canes in Lincoln. If you purchase at least $15 worth of gift cards, they donate 10% toward a charity that buys toys for underprivileged kids! Double the giving! So, those are a few trips on buying cards to give away. But I will be honest – our family stocks up on these cards during December to use for us. This way in the remaining months of winter, we can eat out for a bit less money. Our favorite place to do this in December was Runza. We bought the $25 gift card, then used it buy our lunch that day, going home with a free meal certificate. We “may” have done this a few times :-), and now we have “free meals” to enjoy after Christmas. My husband and I recently did this for a date lunch as well. 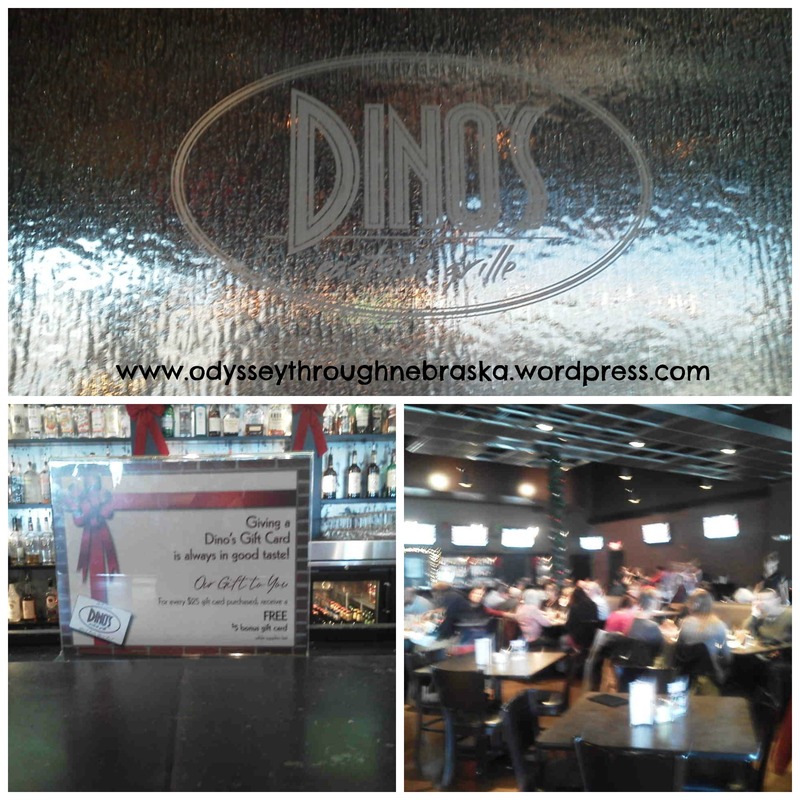 When dining at Dino’s Eastside Grille, we purchased $25 gift card. We received $5 free! We paid for the meal with our gift card, and now we will get to dine there again on another date with our remaining balance! I love driving around this time of year – streets just seem happier this time of year with all of the lights! I would love them up to shine all winter, but my husband usually shuts them off sometime in January (and most people are done earlier than that!) I guess I had better enjoy them while I see them! 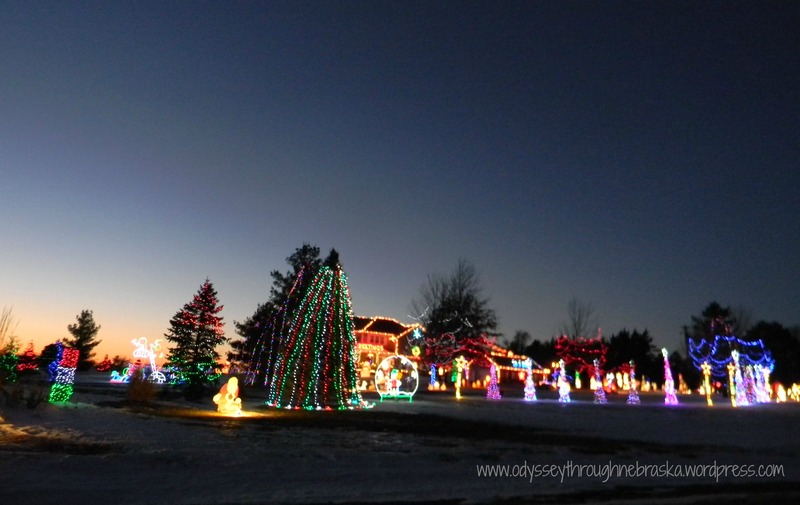 The light pictures above and the at the bottom of the post from our favorite place to drive by every year! I think I might even be able to sing along with their song sequence by now! 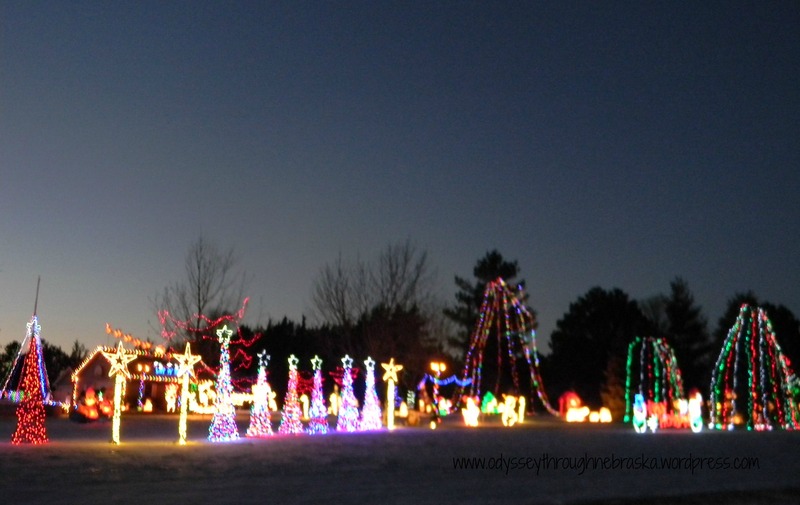 In most small towns, finding the best decorated houses is a bit easier. With lights on many a corner, finding the most fun displays in cities and larger towns is a bit challenging. So I thought I would provide you with a few links of some of the best lit homes across the state. At least according to my initial search – I am sure I missing many beautifully decorated homes. If you know of a great display in your area, please post a comment below or a link on my Odyssey Through Nebraska Facebook page. Photo from Minden’s above website! Despite searching the larger towns in this region, I could not find any published record of any great displays. If you know of any, please post them. May the lights shine brightly wherever you are! While much is known about the history of Fort Robinson, not as much is documented on the particular families that stayed there. Especially in the Officer’s Quarters. At least I should say the information is not readily available. Maybe that is a research project for another time … But I will share what I know and hopefully give you a glimpse of the military housing for families from long ago. This was before. The initial place where officers and families lived for the first few decades the fort was open. This is after. I am sure that if any families actually were there when the transition was made they had to had definitely felt like they were “moving on up” but to the west side, as these house were located at the end of the western edge of the parade ground. These new houses were known as the “officer’s bricks” and were actually large duplex. More than ample space to house a family. The one we stayed in had a sunny kitchen, a dining room that easily seated 10-12 people, a living room and library area (which is currently a bedroom) and a bathroom. The second floor had four bedrooms and two bathrooms. The third floor had two more bedrooms and and an additional two bedroom and one bathroom. We think that was probably where the help stayed. You could not have easily ran this household without servants or hired help! 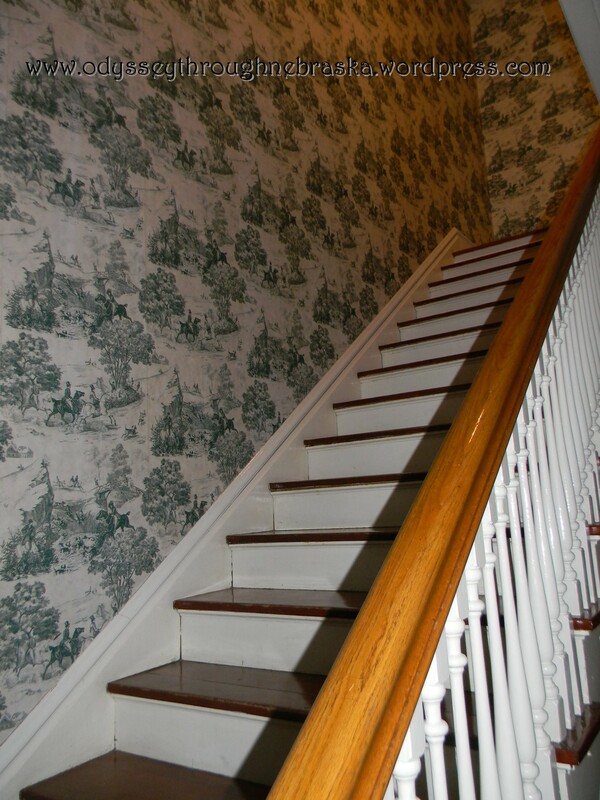 The home also had two sets of staircases. Beautiful white woodwork is found throughout the home. While there has perhaps been a bit of restoration, for the most part the house is just as it was a century ago. I must say that I loved the historic element. Fireplaces graced every room – more for function than for beauty. I would imagine winter is a bit chilly in Northwest Nebraska. 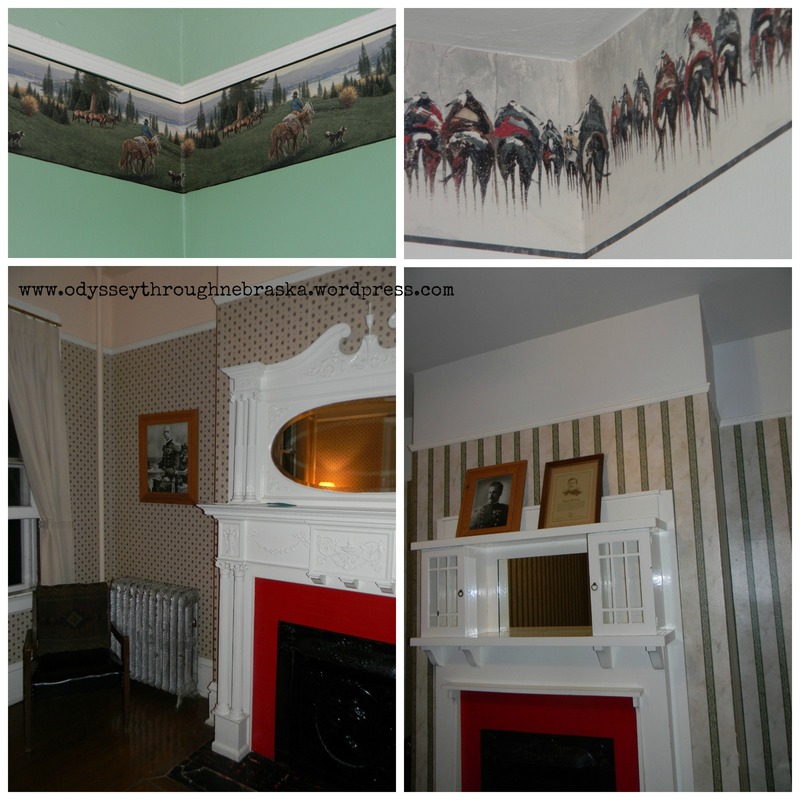 The decor featured borders with a Western motif. Soldiers photographs and stories were on the walls and mantels, adding authenticity to the history. I imagined a story behind every corner. Wondered what it would have been like to raise children on the wild frontier. Pondered about missing comforts from home. Thought about just how many people filled the walls. Concluded that probably many a mom has called out “Please stop running through the halls and up & down the stairs” just like I did. Recognized that the rooms had housed many a family with many a tale. While I wish I had more concrete details, I do think that part of the beauty of the place is all that is left untold. 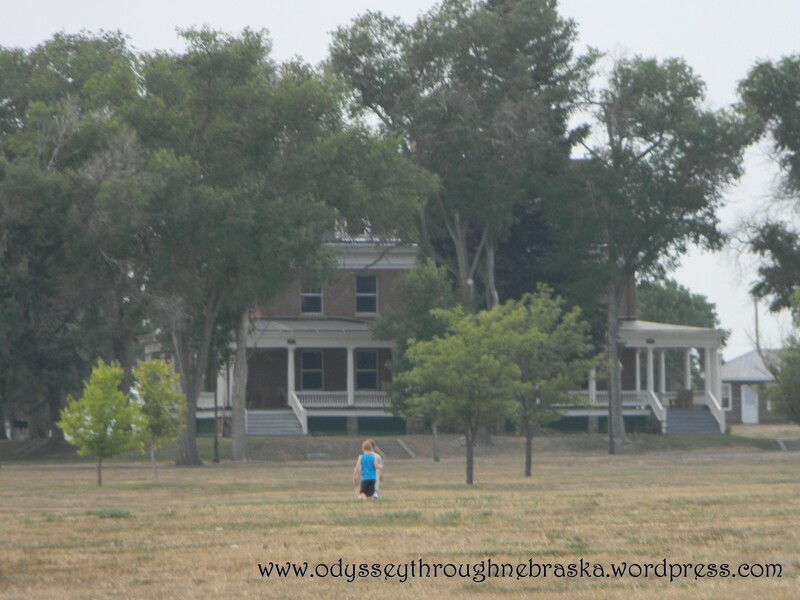 Our own stories were written during the meaningful days spent at Fort Robinson! P.S. Congratulations to my Dad for guessing correctly where we were from my “Wordless Wednesday” post this week. Since he and my mom graciously took care of our housing for the week, it seems fitting that he would recognize my pictures. Thanks to both of them for investing in family memories! 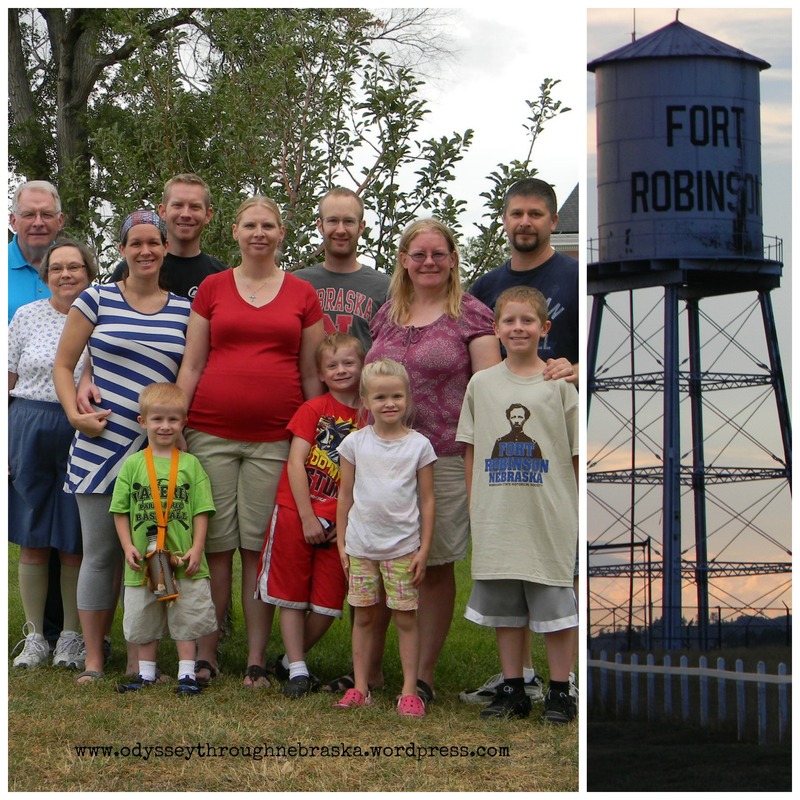 At first writing about Fort Robinson as being a place to be home for the holidays might seem a bit odd. After all, other than possibly being open for their annual December historical Christmas dinner, Fort Robinson State Park is basically closed from November through March. So, the officer’s quarters are shut for the winter. 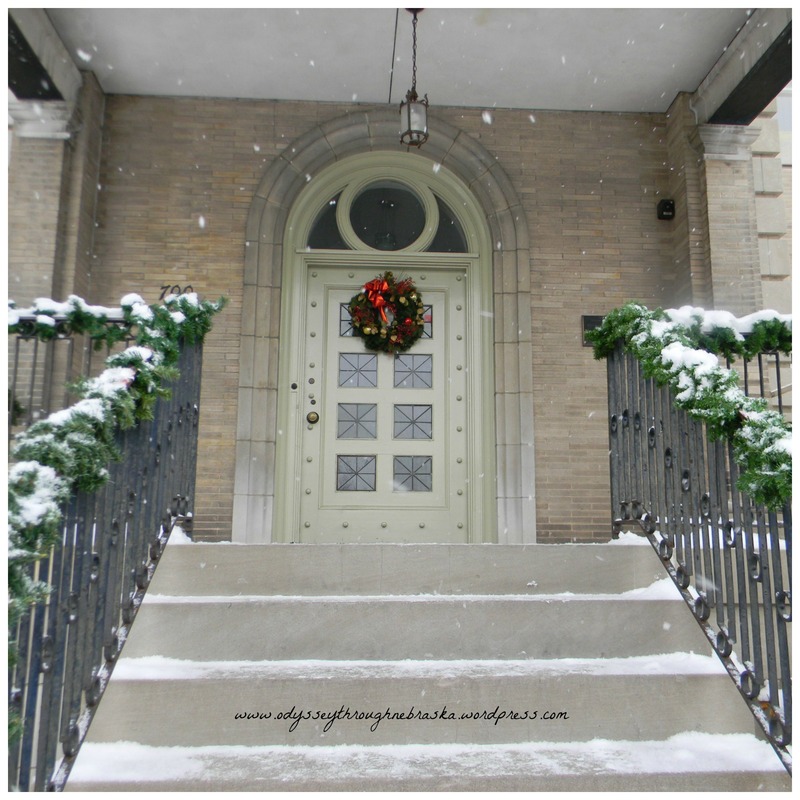 No holiday decorating taking place in these homes from time past. A view of one of the officer’s quarters from a distance. Yet as I have seen “commercials” on this Christmas, I became more and more convinced that this needed to be my focus today. You know the video clips where military families from overseas send their greetings? The ones that often bring tears to my eyes. Where soldiers and often their families are far from the U.S., so that we can be home for the holidays? Where we are living in relative peace and safety, and where they are choosing to forgo that privilege, at least for a season. 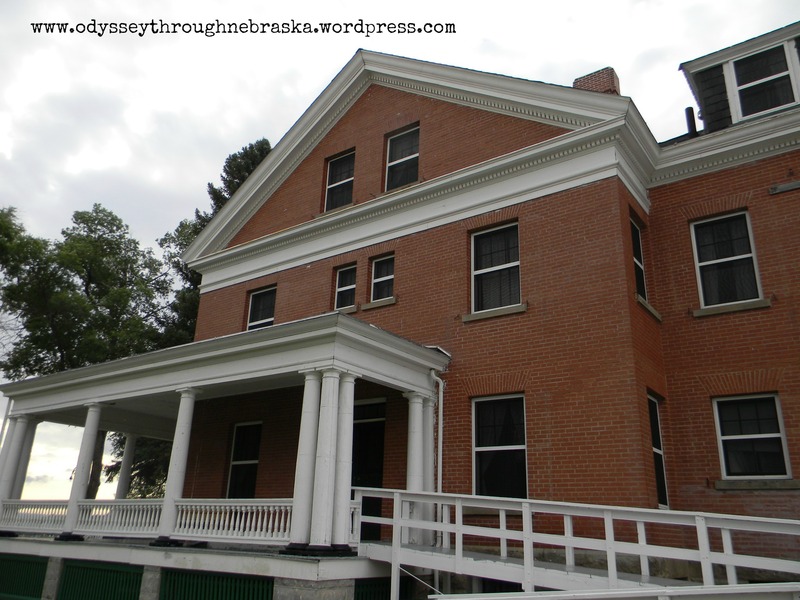 The setting would have been similar back when these Fort Robinson officer quarters were occupied over one hundred years ago. The soldiers may have been at “home” for the holidays, yet they were far from their original dwellings to protect the peace of a fledgling frontier. Sacrificing comfort and security to provide those very things for others. Tomorrow I will write more about the quarters and the soldiers that called them home. But for today, I just wanted to say thank you. To our military, thank you for serving our country and for fighting to ultimately win peace on earth. Thank you for sacrificing your freedom to provide that very thing that you currently lack. After all, is there any better time to be grateful than this season? That first Christmas a young couple were also far from home. Their sojourn and birth of their son would provide me with the opportunity to find ultimate freedom. Another undeserved gift and sacrifice. As I ponder all of this that has been given to me, I cannot help but think of a song that I heard again last night. The one that, according to Ace Collins in The Stories Behind the Best-Loved Songs of Christmas, was written during the midst of war. 1942 – a time when this nation was longing to have hope that conflict would soon be over. A meaningful song still today as it reminds us to pray that someday everyone will get to be home for the holidays.